Super 8 was released on June 10, 2011, in conventional and IMAX theaters in the United States. The film was well received, with critics praising the film for its nostalgic elements, visual effects, musical score, and for the performances of the cast, in particular, both Fanning and newcomer Courtney's acting was cited, while also being compared to such thematically similar films as E.T., Stand by Me, and The Goonies. Super 8 was also a commercial success, grossing over $260 million against a $50 million budget. The film received several awards and nominations, primarily in technical and special effects categories, Giacchino's musical score, as well as for Courtney and Fanning's performances. Abrams and Spielberg collaborated in a storytelling committee to come up with the story for the film. The film was initially reported to be either a sequel or prequel to the 2008 film Cloverfield, but this was quickly denied by Abrams. Primary photography began in fall (September/October) 2010. The teaser itself was filmed separately in April. Super 8 is the first original J. J. Abrams film project produced by Amblin Entertainment, Bad Robot Productions, and Paramount Pictures. Abrams' original plan was to film all of the sequences for the film-within-a-film, "The Case", in Super-8 using Pro8mm stock and cameras. However, this approach proved unsuccessful, as visual effects house Industrial Light and Magic found it impossible to integrate CGI into the footage due to the format's graininess. For sequences involving CGI, cinematographer Larry Fong used Super-16 instead. 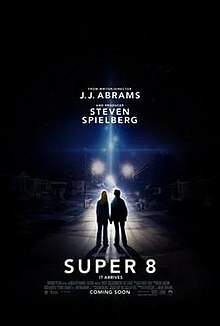 Like Cloverfield, an earlier J. J. Abrams-produced film, Super 8 was promoted through an extensive viral marketing campaign. The first trailer for the movie was attached to Iron Man 2, released in May 2010. The trailer gave the premise of a section of Area 51 being closed down in 1979 and its contents being transported by freight train to Ohio. A pickup truck drives into the oncoming train, derailing it, and one of the carriages is smashed open while a Super 8 camera films. Fans analyzing the trailer found a hidden message, "Scariest Thing I Ever Saw", contained in the final frames of the trailer. This led to a website, www.scariestthingieversaw.com, which simulated the interface of a PDP-11 and contained various clues to the film's story-line; the computer was eventually revealed to belong to Josh Woodward, the son of Dr. Woodward, who is trying to find out what happened to his father. Another viral website, www.rocketpoppeteers.com, was also found, which like Slusho from Cloverfield plays no direct part in the film but is indirectly related. The official Super 8 website also contained an "editing room" section, which asked users to find various clips from around the web and piece them together. When completed, the reel makes up the film found by the kids in Dr. Woodward's trailer, showing the ship disintegrating into individual white cubes, and the alien reaching through the window of its cage and snatching Dr. Woodward. The video game Portal 2 contains an interactive trailer placing the player on board the train before it derails, and showing the carriage being smashed open and the roar of the alien within. The film was released on June 9, 2011, in Australia; June 10, 2011, in the United States; and August 5, 2011, in the United Kingdom. On June 8, Paramount also launched a “Super 8 Sneak Peek” Twitter promotion, offering fans a chance to purchase tickets for an advance screening, taking place on June 9, 2011, in the United States. The film opened at #1 in the U.S. Box Office for that weekend, grossing about $35 million. Super 8 received positive reviews from critics. On the film-critics aggregator Rotten Tomatoes, the film received a score of 81%, based on 283 reviews, and a rating average of 7.35/10, with the consensus that: "it may evoke memories of classic summer blockbusters a little too eagerly for some, but Super 8 has thrills, visual dazzle, and emotional depth to spare." Metacritic, which assigns a weighted average score from 1–100 to reviews from critics, assigned the film a Metascore of 72 based on 41 critics, signifying "generally favorable reviews". Roger Ebert gave the film 3½ stars out of 4 and said, "Super 8 is a wonderful film, nostalgia not for a time but for a style of film-making, when shell-shocked young audiences were told a story and not pounded over the head with aggressive action. Abrams treats early adolescence with tenderness and affection." Richard Corliss of Time gave it a similarly positive review, calling it "the year's most thrilling, feeling mainstream movie". He then named it one of the Top 10 Best Movies of 2011. Jamie Graham of Total Film gave the film a perfect five-star rating, saying, "like Spielberg, Abrams has an eye for awe, his deft orchestration of indelible images – a tank trundling through a children's playground, a plot-pivotal landmark framed in the distance through a small hole in a bedroom wall – marking him as a born storyteller". Christopher Orr of The Atlantic called it a "love letter to a cinematic era", while Claudia Puig of USA Today praised it as "a summer blockbuster firing on all cylinders". Critics and audiences alike were polarized on the film's ending. Some found it to be emotional, powerful, and satisfying while others found it rushed and forced. For example, writing for MUBI's Notebook, Fernando F. Croce alleged that "no film this year opens more promisingly and ends more dismally than J.J. Abrams' Super 8." Other critics commented negatively on the film's frequent homages to early works of Spielberg, particularly in its depiction of broken families (a theme Spielberg has explored in nearly all of his films). For example, CNN's Tom Charity felt that "Abrams' imitation [was] a shade too reverent for [his] taste." David Edelstein, of New York magazine, called it a "flagrant crib," adding that "Abrams has probably been fighting not to reproduce Spielberg's signature moves since the day he picked up a camera. Now, with the blessing of the master, he can plagiarize with alacrity." In addition to these awards, the film was short-listed for the Academy Award for Best Visual Effects and Best Original Score, and the BAFTA Award for Best Original Screenplay, Best Sound, and Best Special Visual Effects. Paramount submitted it for several considerations for the BAFTAs including Best Film, Best Director (J. J. Abrams), Best Original Screenplay, Leading Actor (Kyle Chandler), Supporting Actress (Elle Fanning), Supporting Actor (Joel Courtney, Gabriel Basso, Noah Emmerich), Cinematography, Production Design, Editing, Costume Design, Original Music, Sound, Makeup and Hair, and Special Visual Effects. ^ Kaufman, Amy (June 9, 2011). "Movie Projector: 'Super 8' faces off against 'X-Men'; both will destroy 'Judy Moody'". Los Angeles Times. Tribune Company. Retrieved June 11, 2011. ^ "A Shot by Shot Description of the SUPER 8 Teaser Trailer; Steven Spielberg Is Producing, J.J. Abrams Is Directing". Collider.com. May 4, 2010. ^ "J.J. Abrams's Cloverfield-esque Super 8 Has 'Absolutely Nothing to Do With Cloverfield'". New York. May 5, 2010. ^ Fernandez, Borys; Kit (May 7, 2010). "Details surface on spooky Abrams-Spielberg project". Film Journal International. ^ "More 'Super 8' Viral Goodness Comes Via Snail Mail". Bloody Disgusting. July 16, 2010. ^ "Super 8 Shooting Schedule for Weirton". Super 8 News. September 23, 2010. Retrieved June 6, 2011. ^ a b Grant, Christopher. "Portal 2 contains an 'interactive teaser' for JJ Abrams' Super 8". Engadget. Retrieved July 30, 2015. ^ "The ASC -- American Cinematographer: Monster Out of the Box". ^ "Super 8". Box Office Mojo. Retrieved October 24, 2011. ^ Watercutter, Angela (June 7, 2011). "And the Super 8 Secret Is ..." Wired. Retrieved October 25, 2011. ^ Smith, Matthew (September 17, 2011). "Super 8 Blu-ray (Updated)". Blu-ray.com. Retrieved October 25, 2011. ^ Sarafin, Jarrod (September 15, 2011). "Super 8 Blu-ray Date Set". Mania. Retrieved October 25, 2011. ^ "Weekend Report: 'Super 8' Checks In at Top Spot". ^ Sosa, Chris (June 13, 2011). "Review: 'Super 8′ an Engaging and Thrilling Throwback". Gather. Retrieved June 11, 2011. ^ Ebert, Roger (June 8, 2011). "Super 8". Chicago Sun-Times. Retrieved January 1, 2013. ^ Corliss, Richard (June 2, 2011). "Super 8: Just as Great as You Hoped It Would Be". Time. Retrieved June 5, 2011. ^ Corliss, Richard (December 7, 2011). "The Top 10 Everything of 2011 - Super 8". Time. Retrieved December 13, 2011. ^ Graham, Jamie. "Super 8". GamesRadar. Retrieved June 2, 2011. ^ Croce, Fernando F. (June 18, 2011). "Notebook Reviews: J.J. Abrams' Super 8". MUBI. Retrieved July 10, 2011. ^ Charity, Tom (June 9, 2011). "Review: 'Super 8' is a real throwback". CNN. Retrieved July 10, 2011. ^ Edelstein, David (June 5, 2011). "A Really Close Encounter". New York. Retrieved July 10, 2011. ^ 4th Annual Coming-of-Age Movie Awards Recipients Named, theskykid.com. ^ 10th Annual TSR Movie Awards – The Results – 2011, thescorecardreview.com, February 26, 2012. ^ "Nominations for the 38th Annual Saturn Awards". saturnawards.org. Archived from the original on January 22, 2013. Retrieved February 29, 2012. ^ "CAS Press Release". cinemaaudiosociety.org. Archived from the original on July 4, 2012. Retrieved February 18, 2012. ^ 2011 BAM Award Winners, themovierat.com, January 11, 2012. ^ Phoenix Film Critics Applaud The Artist, Awards Daily, December 27, 2011. ^ 2011 International Press Academy, December 2011. ^ "2011 SCREAM Awards Nominees and Winners". about Entertainment. Retrieved February 26, 2013. ^ "2011 Teen Choice Awards". Archived from the original on January 3, 2012. ^ "17th Annual Critics' Choice Movie Awards (2012) – Best Picture: The Artist". Critic's Choice. Retrieved February 26, 2015. ^ 2012 Golden Reel Award Nominees: Feature Films, mpse.org. ^ "Tune in Tomorrow for the 2nd Annual YouReviewer Awards!". ^ "33rd Annual Young Artist Awards". YoungArtistAwards.org. Retrieved March 31, 2012. ^ Prinzivalli, Fallon. "2012 MTV Movie Awards Winners: The Full List". MTV. Retrieved December 5, 2014. ^ "15 Finalists Set for Visual Effects Oscar". This page is based on the Wikipedia article Super 8 (2011 film); it is used under the Creative Commons Attribution-ShareAlike 3.0 Unported License (CC-BY-SA). You may redistribute it, verbatim or modified, providing that you comply with the terms of the CC-BY-SA.